Sour cherries are red fruits. Red fruits and vegetables are rich in the antioxidant phytochemical class known as anthocyanins. Phytochemicals give brightly colored fruits and vegetables their colorful hues. Anthocyanins, in particular, encourage healthy circulation, ensure proper nerve function and offer anti-cancer properties. According to a study published in the "Journal of Nutrition" in March 2002, researchers found that plants that contain the most antioxidants include members of the Rosaceae family (fruits include the sour cherry, blackberry, strawberry, raspberry). 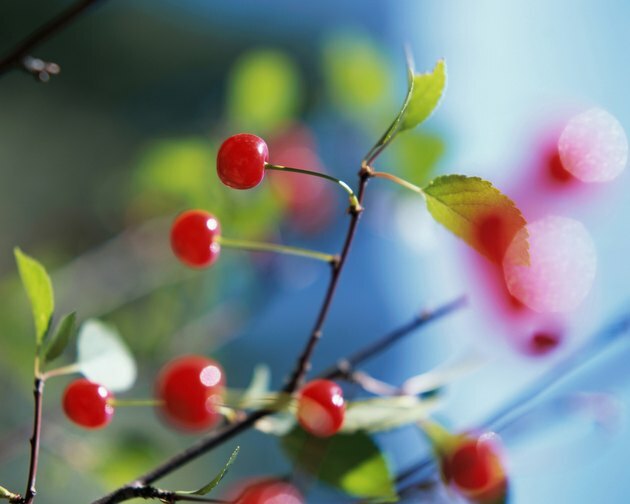 Sour cherries offer a healthy dose of the antioxidant vitamin C. Vitamin C is essential for a strong immune system and plays a role in collagen synthesis, as well as wound healing. In addition to vitamin C and anthocyanins, sour cherries are loaded with three disease-fighting chemicals that have been shown to stop cell transformation (leading to cancer) in numerous research studies. These powerful chemicals include perillyl alcohol, limonene and ellagic acid. Only cherries contain all three chemicals. They are particularly protective against breast, lung, liver, skin and colon cancers. In fact, findings from an experiment designed to test the potential of sour/tart cherry anthocyanins to inhibit intestinal tumor development in mice was published in "Cancer Letters" in May 2003. Researchers found that mice consuming the cherry diet had significantly fewer and smaller adenomas than mice consuming the control diet. Cherry anthocyanins also reduced cell growth of certain human colon cancer cell lines in vitro. These results strongly suggest that sour cherry anthocyanins may reduce the risk of colon cancer. Sour cherries contain quercetin, one of the most powerful antioxidants. Among other functions, quercetin prevents oxidative damage, via free radicals, from damaging low-density lipoprotein (LDL or "bad" cholesterol). When LDL cholesterol is oxidized, it is more likely to adhere to artery walls, forming plaque, which contributes to heart attack and stroke. In a study published in the "American Journal of Physiology" in Sept 2006, sour cherry seed kernel extract (10 and 30 mg/kg) significantly improved the recovery of cardiac function (including blood flow and blood pressure) in rats after an induced heart attack. Because sour cherries are rich in two anti-inflammatory compounds, anthocyanins and quercetin, they may be beneficial in alleviating asthma symptoms and other respiratory conditions and offer relief for gout sufferers (gout is a painful form of arthritis). According to an article published in "Science Daily" in February 1999, the anthocyanins and other compounds found in tart cherries inhibit pro-inflammatory enzymes called cyclooxygenase-1 and -2 nearly as well as ibuprofen and other nonsteriodal anti-inflammatory drugs.